Although the bench press is considered by many to be an important benchmark exercise, there's a long-lasting debate as to which variation is better. The two chief versions battling for popularity are the machine and the free-weight bench press. This argument may not be as easy as simply claiming one to be better than the other, however, since both variations have distinct pros and cons. Depending on your goals and fitness level, you may find that one fits your needs more precisely, though. One of the main reasons that the bench press has enjoyed so much popularity is that it's in a particularly useful class of movements called "compound exercises." This means that the bench press uses multiple large muscle groups, accomplishing a lot all at once. Specifically, your chest, shoulders, triceps and even your core are all put to work during the bench press. The "Journal of Strength and Conditioning Research" performed a study to decide which version of the bench press activated more muscles. Their research found that using free weights engaged more muscle fibers, especially in the medial deltoid. The reduced muscle activation of the bench press machine is probably, at least in part, due to the limited range of motion. The safety rails of the machine restrict your movement to make sure that you don't drop the weight or injure yourself. This makes the machine more useful for beginners looking to build strength or patients recovering from an injury. Unfortunately, it also means that the machine will not strengthen the full range of motion that a free-weight bench press will. The fact that the free weights could sway requires the additional activation of stabilizing muscles. 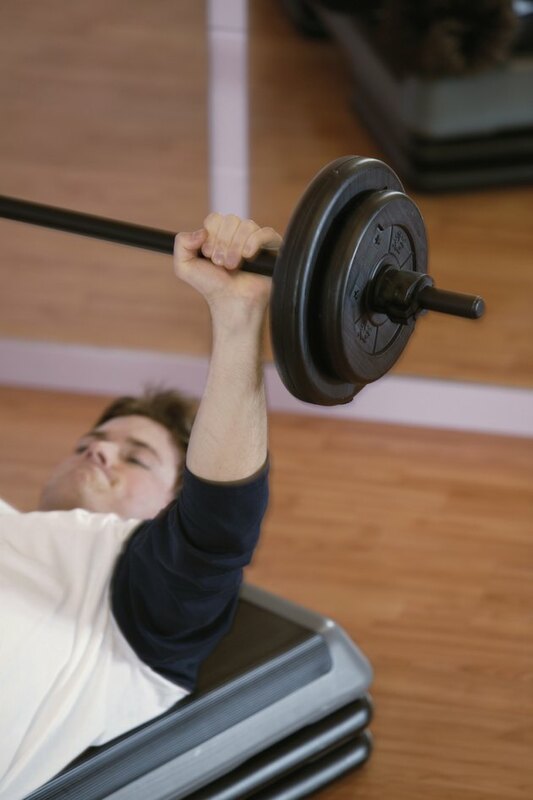 As mentioned, the bench press machine is an effective way to treat and avoid injuries. In addition to the rails that keep the weight above you, most machines also include a guard that stops the weight from falling directly onto you. This provides additional safety for people looking to lift very heavy weights without a spotter. Free weights, however, do not come with these added precautions, so exercisers must often work with lighter weights. Bench press machines are large and often expensive. They may also require special maintenance to keep them working smoothly. Free weights, on the other hand, are an inexpensive, easy-to-find option. There is also no maintenance needed for free weights, and you have the ability to use the weights for other exercises besides the bench press. BuiltLean: Free Weights vs. Machines - Which Is Better? Do Push-Ups Increase Your Bench Press?